It is 7:30 A.M. Pacific Standard time. My coffee is hot and I have a craving for bacon. 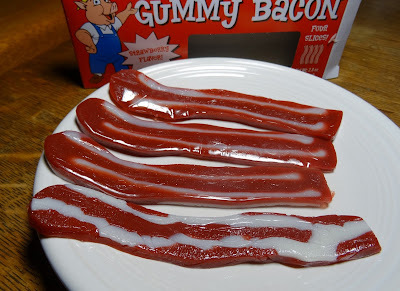 The only bacon in the house is 'Uncle Oinker's Gummy Bacon (strawberry flavored). Against my better judgement I open the package. I scan the ingredient list to find no actual bacon is in this product. It is also made in China. Oh my! Here we go. Sweet & sticky with strawberry flavor is this chewy stick of baconesque looking object. It is not terrible but is not something I can give a Chilebrown seal of approval on. Greg, I also may be a sucker for all-things-bacon. Where are the gummy eggs? Three Dogs BBQ, I think I may pass if it is anything like the bacon.